Informal communication has a key role to play in driving sustainability-oriented institutional change, said Antonius Raghubansie (Green Academy Lead at the University of Worcester UW) at a workshop titled ‘The Worcester sustainability model now and the future: maintaining momentum from the green academy’ held at the university on 28 May 2014. Hosted as part of the Workshop and Seminar Series 2013/2014 of the Higher Education Academy (HEA), this event shared and reflected on the approaches used at Worcester to create Institutional change in response to the sustainability challenge, discussed examples across subject disciplines and showcased the project work of students. The event started with a welcome by Dr Marie Stow ell (Director of Quality and Educational Development UW), who emphasised on the importance of impacting on students’ attitudes and values with a view of building a community of practice rather than merely teaching about sustainability. Representing the HEA, Helen Howard outlined the HEA Green Academy programme and said that sustainability is important for universities to enhance the effectiveness of learning. She also highlighted that innovation, a key element in institutional sustainability programmes, would depend on the different contexts of respective institutions. Will Bowen-Jones (Head of Education Development Unit) kicked off the first session, on Curriculum and Engagement. Speaking on the Learning & Teaching Strategy and sustainability at Worcester, he highlighted that producing graduates who are ethically and environmentally responsible is central to the university’s strategic plan. Katy Boom (Director of Environmental Sustainability UW), speaking on Campus and Community, revealed how the university uses both community projects and the campus as curricula and extra curricula sustainability opportunities for student learning. 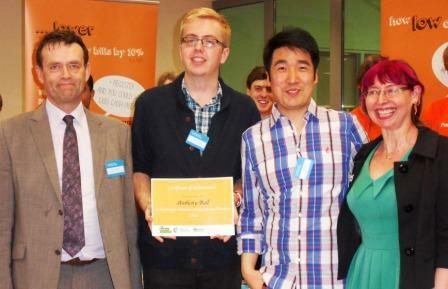 She focused on a number of flagship projects, including Energize Worcester funded by the NUS Students Green Fund. She also elaborated on the types of funding available for curriculum projects. Peng Li (Project Manager Energize Worcester UW), presenting the student perspective, revealed that the majority of the students want their universities to become more sustainable. Antonius Raghubansie (Green Academy Lead and Associate Head, Worcester Business School UW), speaking on the university’s distinctive Sustainability Elective for all disciplines, revealed the story behind its development and stressed on the key role that informal communication had played in the process, particularly in the initial stages. He also highlighted the distinctive elements of this elective, including the student-centred approach, the focus on personal responsibility, assessment through live projects and the virtual learning environment (VLE). Wendy Corbett (Digital Publishing Creative Consultant and Visiting Lecturer in Design and Creative Digital Media), spoke on linking curriculum, campus, community and co-creating knowledge through creative digital technologies and online learning and teaching strategies. She presented the digital magazine hosted by the university, www.susthingsout.com, which comprises an external facing side (a publishing platform) and an internal learning side, which only students and staff can access. She observed that, in the absence of instructor competence and course content, no amount of technology would add value to learning. Professor Stephen Martin (Visiting Professor), speaking on ‘Managing Complexity: Integrating the “Witness” Session,’ stressed on the importance of building bridges between the university and its wider community. He stated that universities should bring interdisciplinarity and complexity into the lecture rooms so that, when students leave as graduates, whey would be well prepared for the messy outer world. During the lunch break, the participants visited student displays and engaged in discussions. Moreover, adding a touch of celebration to the event, Steve Egan (Deputy Chief Executive Officer of the Higher Education Funding Council for England HEFCE) presented the Energize Worcester Energy Saving Champion 2014 award to Anthony Ball. The third session was a participant workshop on Marginal Gains, led by Will Bowen-Jones. In this small group work, which used a sustainability café approach, the participants shared ideas, perspectives and experience, building on the content of the earlier presentations. The workshop was followed by an optional tour of The Hive, UK’s first public/university library, which is a partnership between the University of Worcester and Worcestershire County Council. Leading the tour, Iain Paul (Design Manager), revealed how vision, leadership, collaboration and consultation with many stakeholders paved the way for this multiple award winning joint library and history centre, housed in an ‘Outstanding’ sustainable building.